Prop up your legs or back for a better night of sleep! Unable to get a good night of rest – your problem may be the angle of your bed. Unfortunately most beds can’t be adjusted but you can change the elevation of your legs and back with the DMI Ortho Wedge Pillow. This wedge is designed for upper and lower body use – making it the best choice for back pain, neck pain and a variety of leg problems. Our team did some searching and put together the most comprehensive review of the specifications, pros and cons, plus some additional information on shipping and delivery options. Sleeping flat on your back or stomach does not work for everyone. 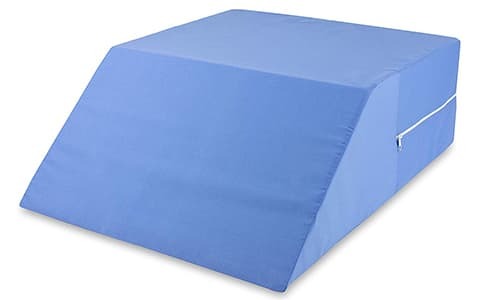 Some people with painful joints and other medical conditions need to sleep elevated legs or a propped up back with a orthopedic wedge pillow. The DMI Ortho is perfect for post surgery, vein pain and other difficult to sleep with conditions. Where does DMI ship to? Ready to try the DMI Ortho? Want to take some pressure off a sensitive area tonight in bed – then order your DMI Ortho right away. Stop stacking pillows and start find a better place to rest your legs tonight!